A very well researched book, the basic premise of Jyoti Atwal’s Real and Imagined Widows is located in the ‘absence’ of a single dominant cultural practice that could shape and determine the question of widow remarriage in the vast and diverse region of the United Provinces. The author closely maps the castes/tribes in different geo-economic regions of this province to define the variations existing among widows ranging from Sati, to prohibition of remarriage, the remarriage and the sale of widows, etc. For this, she gives weightage to changes in economy, landholding and caste structure in different regions of UP, and the resultant increasing labour demand for women in certain caste-groups both in agriculture and the household. The author fruitfully broadens the discourse of the reformists, conservatives and the nationalists based upon community identity regarding widow remarriage by contextualizing this problem within the differing contours of agrarian economy. 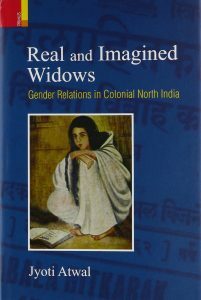 Considering the fact that the plight and fate of widows in different regions and among different caste groups in India have received not inconsiderable scholarly attention from the academics, the author has been able to analytically imbibe all this and has also successfully carved out a space for her study of widows in a particular region. This assumes importance as UP emerges as a sort of chromosome for India, as it combined various cultural practices followed by different caste groups in relation to the widows. What has also been brought out well is the raging debate in the thirties between the two contending and unequal ideologies: the ‘rights of women’ and the accent on ‘male succession’ to property. Significantly, this debate resurfaced in Independent India around 1955-1956 when the Hindu Succession Act and the Hindu Marriage Act were under discussion in the Parliament and was influential in shaping the laws that were eventually framed. The customary laws regarding marriage, re-marriage, terms of succession, inheritance and maintenance of widows are also brought in by the author and seen especially through court cases. Interestingly, the one dominant binding material that emerges in this study in the otherwise heterogeneous scene of UP is the reigning concept of ‘fidelity, purity and chastity’ of widows. This has been rightly termed—the ‘Sati’ or the ‘Sita’ syndrome—a syndrome based upon the notion of a Hindu woman’s image as ‘pativrata’, a consuming concern with her chastity which can be seen to run as a thread across most caste, class and regional differences. In handling the Sati or the widow problematic the British officials show varied reactions based upon the nineteenth century colonial knowledge of the practice. It is noticeable that the British officialdom was severely divided over how India was to be governed and what laws were to be framed or adopted. Their reactions to Sati and different practices being followed in the same district by different castes and communities, to what was considered ‘legal’ and what was not, building up of the pressure against it as well as the court cases eventually led to the enactment of the 1829 Act against it. In fact, the subsequent Hindu Widows’ Remarriage Act, 1856 can be read as a complementary Act to the anti-Sati Legislation as it removed all legal obstacles to the remarriage of Hindu widows. The question of the widow was deeply connected with the concept of patriarchal ‘honour’. In this the overwhelming accent on the control of female sexuality emerges as the major binding force in this book not only for the upholders and regulators of patriarchy but also for its ‘victims’. Even legally, the concept of ‘honour’ and ‘dishonour’ that the sexuality of a widow invoked seemed to have carried weight in the judgments imparted in the colonial period. It is this well-known sexual code generally associated with, and defined as the ‘Brahmanical code’, tempered with ‘material setting’ which resulted in the observation of different caste codes for widows. What may also perhaps substantiate this viewpoint is the possibility of differing social position of Brahmins in UP, as compared to some of the other well-known States like Haryana and Punjab. How effective and binding was it in the given period? Was there, for instance, any opposition from the Brahmins to the Chamars giving up the custom of widow remarriage, as in some other areas? For elaborating the ‘imagined’ widows as given in the title of the book, the author refreshingly attempts to bring to the fore the ‘widow’s voice’, though difficult to trace through references to literature and popular Hindi journals of the period. This imparts to the book an entirely fresh angle. One is struck in the given account by the fact that the widows visualized themselves as ‘sexual objects’. One such work taken up for analysis is the novel Widhwa ki Atmkatha (Autobiography of a Widow)’, written in 1931 by the Hindi poet and novelist Priyamvada Devi, who became a widow after only four years of marriage. The basic thrust of this novel relates to how sexual relations are integral to gender relations. The widowed protagonist is shown as the embodiment of innocence and pure sexual desire in her various sexual liaisons and betrayals. How does one read this for determining the widows’ victimhood or agency? It may be noted that anxiety over widows’ bodies was also central to the reformist concerns and discourse. The one course open to her was remarriage, which also re-established a control over her sexuality. This underlying solution permeates many of the literary works penned during these years. As opposed to the dominant reading and accent on the sexuality of widows in the literature of the period, the cinematic representation of the Hindu widows in the immediate aftermath of Independence embodies the middle-class notions of shame, honour and chastity. The coming of the widows into public discourse gets portrayed in films of the 1950s specially, as a character in her own right, and is shown to be as closely shaped by the popular ‘ideal image’ of her as popularized by Mahatma Gandhi, i.e., widows as participants in the anti-colonial struggle and nation building and in fact symbolizing the Nation itself. As someone interested in cinema study, I particularly liked the author’s inclusion of a cinematic representation of widows. For this the author has picked up Mehboob Khan’s 1957 film Mother India, and analysed it in the reigning milieu of social reformist discussions and debates of the nineteenth and twentieth centuries. The film is shown to represent a powerful imagery of Mother India as found in the nationalist discourse. This gendering of cinema is seen in terms of complex gender debates initiated during the colonial period representing the cultural extension of the nation making process. Incidentally, this film is regarded as one of the best films in Indian and world cinema. It was India’s first submission for the Academy Award for Best Foreign Language Film in 1958, where it got the nomination and lost the award by just one vote. It was an effective contradiction of the 1920s book, Mother India by Katherine Mayo and set a competing image of India’s womanhood abroad. MK Gandhi had publicly condemned Mayo’s work as that of a ‘drain inspector’. This book is a valuable addition to the existing works on question of widows, inheritance and remarriage, and fully succeeds in highlighting the varied responses to the question of widows in UP based on various equations of caste, class, regional peculiarities and their effect on gender relations. It would be of great interest to scholars and researchers of history and gender studies. Prem Chowdhry, a social scientist and historian, is Senior Academic Fellow at the Indian Council of Historical Research, New Delhi. She is a feminist and critic of violence against couples refusing arranged marriages.